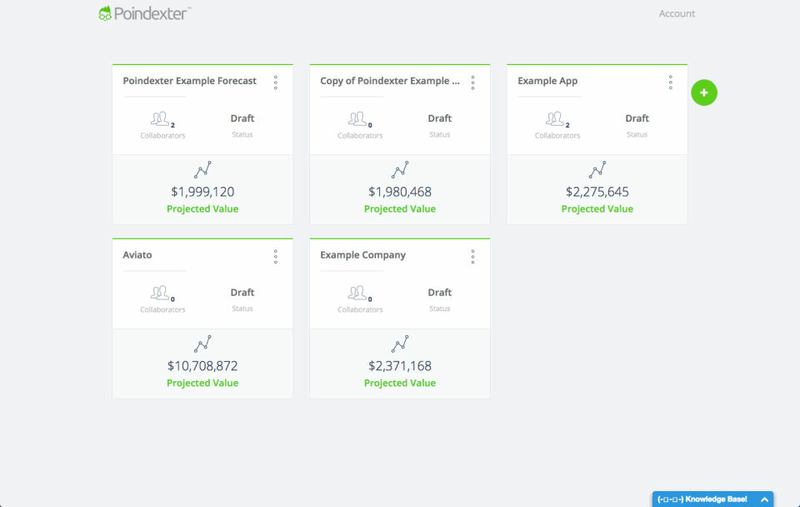 The Poindexter Business Plan software helps to prepare yourself to deal with any given scenario.The software features performance tracking that helps to track your revenue and bank account balance.Moreover, Poindexter can deliver 3 years to 10 years of financial forecast.The monthly goal dashboard helps to keep track of your acquisition goals.The software also provides answers to the various complicated financial questions without any lag.You can even provide a password protected link to all the stakeholders,so that they can read and edit your business plans.The software also automatically provides full financial statements that helps you take detailed decisions. How much does Poindexter cost ? The pricing for Poindexter starts at $12.0 per month. 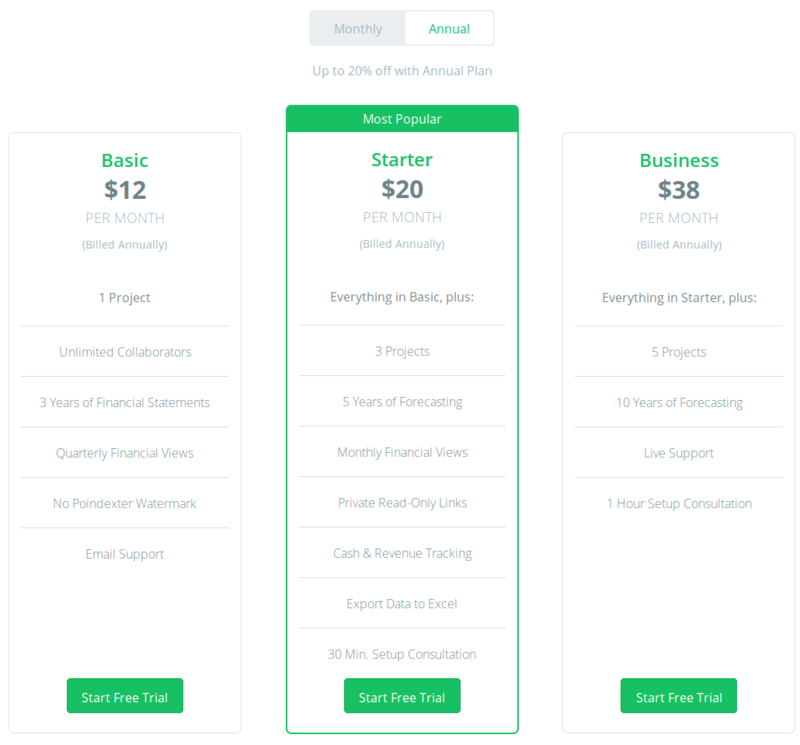 Poindexter has 3 different plans such as - Basic at $12.0 per month, Starter at $20.0 per month and Business at $38.0 per month. Poindexter also offers a custom plan based on the customer's request. For more users, projects, support. It's an one of a kind software to manage my monthly/annual financial projects and budgets. Pros: Upgradation is not painful as this software is worth it. It had really helped me create a financial plan for my business and I don't have to think about feasibility of projects anymore because it plans and makes assumptions on my part. Cons: I really hate naming of some modules, and I started with a free version with no help with downloading, and I wish they show me more graphs and stats. Overall: It really helps me finalize a decision real fast based on the prioritizations and simulation of business outcomes. 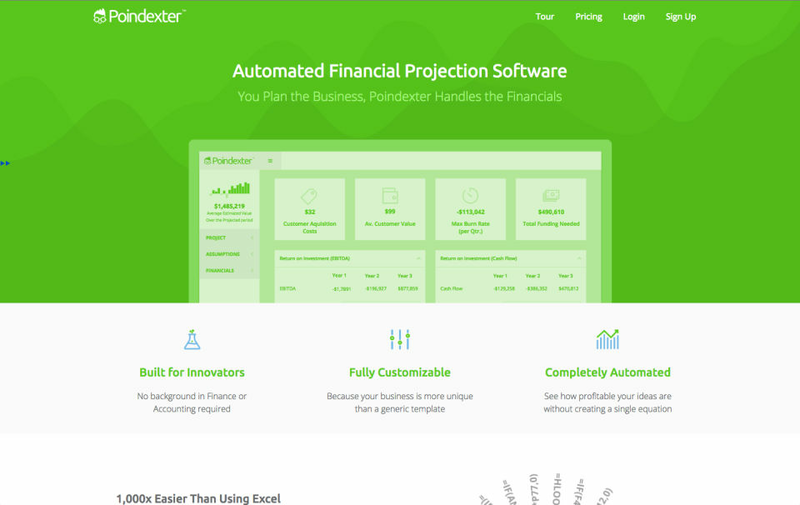 Pros: Poindexter is a financial projection software that is easy to use. Put in numbers and it gives you projections immediately. Cons: The Basic free version does not allow downloads. But the Pro version allows unlimited downloads to Excel. Pros: It was free to start, which meant no risk to me. This is going to help make my investment analysis process much quicker and more productive. Cons: The naming of some modules can limit your initial perception of what they¿re capable of doing. 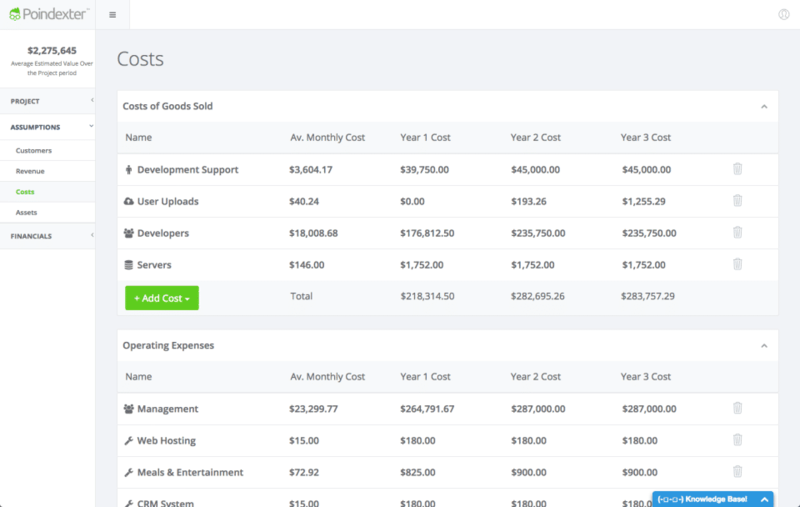 Overall: I used Poindexter to forecast my real estate business investments, and was very impressed by how quickly I was able to start generating insights. The UI made learning the software very straight forward, and once I began to dive in I started to realize how powerful it really is. Recommendations to other buyers: Don¿t invest in a new business venture until you at least run some numbers through Poindexter first. 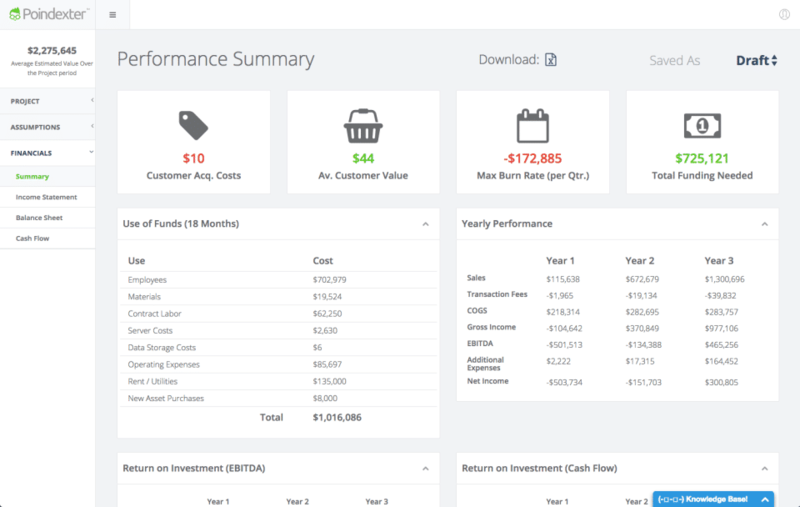 Pros: The easy to use interface that basically walks an entrepreneur through assumptions used in creating a financial model. Pricing is free or very cheap if one upgrades (totally worth it). Cons: Not many. There's not really anything else like this on the market and if there is, its cost prohibitive - especially to entrepreneurs. Overall: I am a CPA and a few of my clients have been itching to start new ventures. Although I'm quite good with excel, it still takes time and brainpower to properly determine the viability of their ideas - and those models will likely need to be adjusted or scrapped. Luckily, I stumbled across Poindexter and I coached my clients on how to use it. The website is easy to use and basically walks the user through "modules" where they set their assumptions (i.e. on an advertising campaign, whats the average cost per click? how many clicks per conversion? etc) and from there, it will spit out financial projections. These models can be as simple or as extensive as the user wishes. As a CPA, I can spend less time developing excel models and more time determining the viability of an idea based on the models and underlying assumptions my clients present to me within Poindexter. 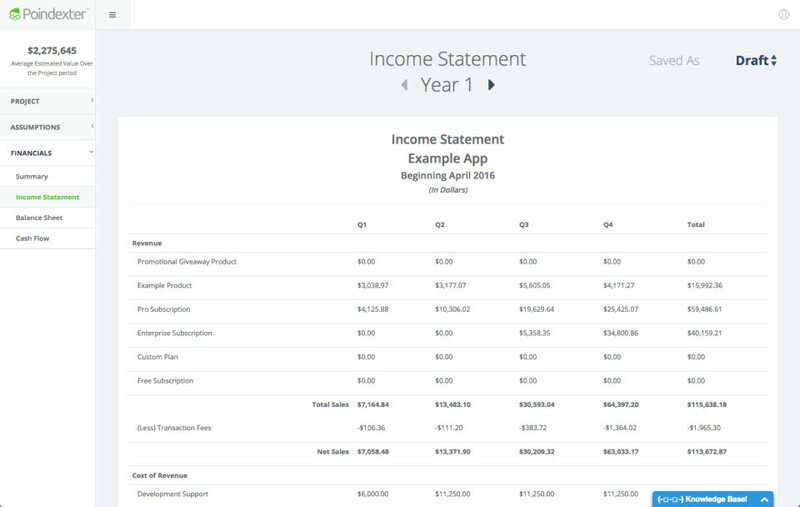 Recommendations to other buyers: For the bootstrapped entrepreneur who refuses to use the help of a financial analyst or CPA, I'd definitely recommend obtaining a basic understanding of financial statements (Income Statement, Balance Sheet...and for the more adventurous, the Cash Flow Statement) and playing around with how changes in assumptions impact those projected financials. That knowledge paired with the help of this software can probably help you sift out a good chunk of the crumby ideas. That said, I'd highly recommend asking a professional to at least take a look at your final model/idea before starting a venture. Pros: This app is really easy to use, and in a matter of minutes I was producing financial data for my company. Poindexter is a real time saver. Cons: I would love to see some more graphs, and visuals. Overall: I¿ve started a few companies, and I wish I found this earlier. I loved how quickly I was able to test the assumptions of my business plan, and how simple it was to run through different scenarios. Recommendations to other buyers: Honestly, just give Poindexter a shot. You literally have nothing to lose, and everything (especially time) to gain. Overall: I checked out the tool and looks great. Very clean design and couldnt find any faults with the interfaces or designs. Most importantly being able to access your pertitant small business data anywhere is essential and this co. nails it. If you think you have a good idea/app/product, use poindexter first! Pros: I really liked the sample project they provide to help me understand. Also the help and explanations for each of the fields was invaluable. Cons: The live updating of numbers I like. But it needs to be on more screens. Overall: I am a software developer and I get a lot of people coming to me with "I got this great idea"'s. Some sound good, some sound crazy, but Poindexter lets me talk sense into these people. I ask them to quickly put together a financial projection of their idea. Include basic dev costs and hosting and then basic revenue streams. 5 minutes and they get a number saying if they are crazy or not! Recommendations to other buyers: Seriously, this software will save you lots of time and money before you embark on a project or investment. Is there any business plan software that can provide a forecast of up to 10 years? Very few business plan software are present in the market that can deliver a forecast up to 10 years. One of them being Poindexter.